‘Variable as is the European Hawthorn, it is distinguishable into about three principal forms, which represent as many Botanical species. Of these, the first, with deeply pinnatifid leaves, round smooth ovaria, and compact cymes, is the true C. oxyacantha; to which are to be referred as varieties, C. laciniata of Besser, the pink and yellow-berried Hawthorns of the Gardens, and the C. monogyna of various authors, with their synonyms. A second form is the C. fissa of some of the English Gardens, but not of Bosc, which has broad, deeply cut, pinnatifid leaves, downy beneath, especially at the axillae, and black fruit: this may be called C. platyphylla. The third form is the subject of this article [Crataegus oxyacanthoides Thuill. 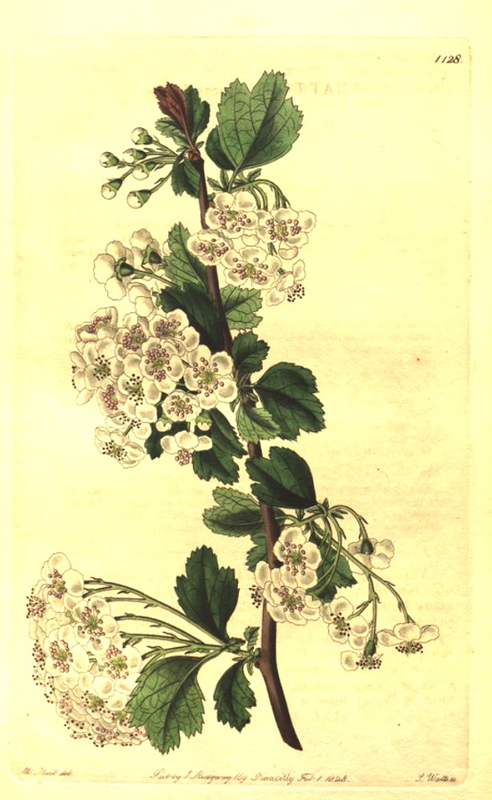 ], to which undoubtedly belongs the double Hawthorn of the gardens; and also, as a remarkable variety, the Crataegus triloba of Persoon: it has peculiarly loose cymes of flowers, and cuneate, obtuse leaves. A handsome hardy shrub, or small tree, native of the neighbourhood of Paris, according to Thuillier and Decandolle, and probably of most parts of Europe; where it is to be expected that it has been confounded with C. oxyacantha. The plant from which our drawing was made flowered last May, in the Garden of the Horticultural Society, to which establishment it had been presented by Messrs. Loddiges. It is propagated by budding or grafting upon the common Hawthorn.’ The plant figured has loose cymes of double flowers. [BR f.1128/1828]. Flore des Serres figures two double forms, flore albo plena and flore rubra plena. [FS f.1509/1862]. Listed in all published catalogues [T.353/1843].